Wed., Aug. 22, 2018, 11:52 a.m.
SEATTLE – Sounders general manager Garth Lagerwey knows he isn’t out of the proverbial woods from either a team or job-security perspective. Six consecutive victories and a nine-game unbeaten streak notwithstanding, it has been a rough season for the fourth-year Sounders boss. Two months ago, his team was in last place and #FireGarth hashtags were out in force on Twitter at the worst time possible given what Lagerwey and the Sounders have long known was scheduled for September and October. Every four years, unprecedented in North American sport, the Sounders allow their Alliance Council of fans to decide the GM’s fate. Lagerwey noted that land mine when he signed on in 2015, but being retained seemed more of a distant formality until his team lost last year’s MLS Cup final and then botched this season’s first half for a third straight year. So, even with the Sounders having yet again reversed their annual nosedive, Lagerwey and the club are bracing for next month’s launch of the second GM vote in its nine-year history. Lagerwey’s season has been stressful enough without knowing his job will literally be in fans’ hands. He said he’d counted on Jordan Morris, Clint Dempsey and Will Bruin combining for 25 goals before an injury to Morris blew that to smithereens. Lagerwey was also left badly exposed, as losses mounted, by waiting until the summer transfer window to sign another designated player from a more premium talent pool. He scrambled day and night in June for an early summer deal with Peruvian striker Raul Ruidiaz, knowing he’d be fit enough to have an immediate July impact once eligible to play. The Sounders are averaging 2.5 goals per match with Ruidiaz, compared with 0.83 before his arrival. Lagerwey had spent months analyzing the metrics, confident Ruidiaz could alter the team’s 2018 fortunes in time by adding offense and freeing up playmakers like Nicolas Lodeiro. But Lagerwey had some long, lonely nights at his Eastside home waiting until that happened, enduring public criticism and resisting more immediate moves to help his own popularity. He and his wife were already sleep-deprived, caring for an infant son – their third – born in January. “I told her not to read the internet,” Lagerwey said with a smile. Now, the transfer window closed and Lagerwey having added Ruidiaz and left back Brad Smith – while missing out on Paolo Hurtado – he has caught his breath and contemplated what’s ahead. That includes the vote, running Sept. 19 through Oct. 17, as part of Sounders minority-owner Drew Carey’s “Democracy in Sport” initiative. The comedian was fascinated by how fans of Real Madrid and FC Barcelona vote on the team’s president and insisted a similar initiative be implemented here before he’d join the ownership team. But with that power comes the need for a broader perspective than reaction-prone sports fans are typically known for. Lagerwey is technically correct that his seventh-place Sounders, who play at No. 6 Portland on Sunday, have “accomplished nothing” yet. His broader accomplishments include winning the franchise’s only championship in 2016, returning to the MLS Cup final last December and overhauling the team’s youth development. “You would hope that enough people recognize the track record,” he said. But his critics also point out the franchise’s original coach, Sigi Schmid, got fired on Lagerwey’s watch and that a slew of U.S. Open Cup titles and a Supporters Shield in 2014 for the league’s best regular-season record all stopped happening once the new GM arrived. Lagerwey admits he’s more focused on winning championships and doing well in CONCACAF Champions League. But he insists he isn’t “brushing off” the vote and understands the seriousness of it. Fans can vote “yes” or “no” to retaining Lagerwey either online at SoundersFC.com/GMVote starting Sept. 19, or in person at home games on Sept. 19, Sept. 29 or Oct. 8. Alliance Council members consist of full or half season-ticket holders or suite holders – excluding ticket brokers – and receive as many votes as tickets on their accounts. Team bylaws require 40 percent of eligible voters to participate for the result to be valid and any firing needs a two-thirds supermajority. The only prior vote in 2012 saw team owner Adrian Hanauer, who doubled as the GM, retained by 96.3 percent of 13,775 ballots cast. “I think that’s going to be impossible to match no matter who the general manager is or what their performance is,” Alliance Council vice president Stefani Steiner said. Steiner is more concerned about getting enough voter turnout for an official result. She assumes the more passionate fans will cast ballots; but is worried about “reasonably satisfied” fans with bigger life priorities than voting on a sports executive. “That’s why we’re getting the message out about this now,” she said. 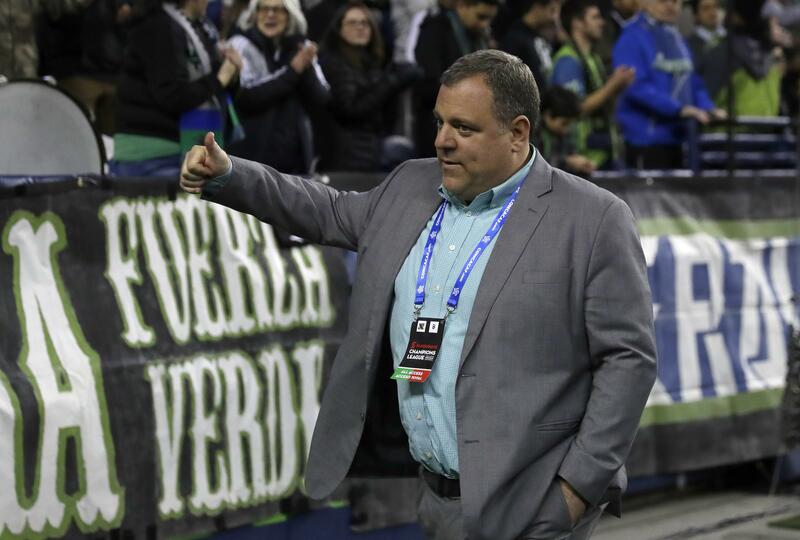 Lagerwey understands some longtime Sounders fans might feel a disconnect from days the team once tried to win every U.S. Open Cup it could to establish a larger Seattle market toehold. But he said the team’s goals, by design, have grown loftier and narrower. Lagerwey insists he isn’t taking fans for granted, but focusing on championships he’s paid to win for an evolving team in an evolving league where playoffs matter increasingly more than regular season or tournament titles. “It’s like being a fan of an Indie band,” he said. “If you knew Pearl Jam when they were playing in front of a couple of hundred people in a garage, you’re going to feel differently about them when they’re playing in stadiums. And he thinks he has positioned the Sounders to do that again. Not only in 2018, where extending this unbeaten streak helps his voting chances, but also for years to come. He’ll know soon enough, once votes are counted, whether Sounders fans agree. Published: Aug. 22, 2018, 11:52 a.m.